I was in bed after a tough day with a grouchy two year old and an impatient eight year old, scrolling mindlessly through Facebook, when I saw Jason Schlarb’s heartbroken post about his son’s reaction to his drop from UTMB last month. Screenshot of Jason Schlarb’s Facebook page. All images courtesy of Liza Howard unless otherwise noted. I typed it out, but decided not to post it. I knew Jason would read the love and empathy in my words, but I wasn’t sure the rest of the kindhearted commenters would. But I meant it–as only someone could who’s had to explain multiple times to her son that winning isn’t everything. A child’s absolutist understanding of racing can be exasperating. But it’s their self-assuredness and moral clarity about DNFs that really chafes. A painful back spasm has left you hobbled and leaning sideways. You struggle along like this for three hours before finally dropping from a race. Tony Constanzo not actually dropping at the Rocky Raccoon 100 Mile. You haven’t kept any food down for hours. Even water makes you wretch. You decide not to death march the next 11 hours to the finish. Michael Canle feeling rotten, but not dropping at the Rocky Raccoon 100 Mile. You got lost and are off course for two hours. Your feet are a blistered mess. It’s unlikely you’ll make the cutoffs now, so you call it a day. Soon-Chul Choi at the finish of the Angeles Crest 100 Mile. The wheels have fallen off. You’ve blown up. This is not your ‘A’ race. You decide to save your legs for your next race. Dana Savage’s last 40 minute mile at the JFK 50 Mile before she dropped. A young child’s moral code is not nuanced. Behavior is either righteous or it isn’t. Giving up is bad. You quit or you didn’t. Certainly it should be easy enough to discount your five year old’s black-and-white assessment of your decisions during an ultra, but, more often than not, it isn’t. Their questions rankle and fester. And their judgments are heartbreaking. And that’s entirely your fault. You read those particular bedtime stories. You coached your children in their values. Perseverance. Tenacity. Grit. You handed them their moral measuring sticks. Our children embody our own thinking. Their code is our code distilled. Felicia Wilkerson’s daughter crying and hugging her after Felicia tells her she has to drop at the Marine Corps Marathon. And certainly viewing your actions through a five year old’s eyes can be useful. Sitting in a camp chair at an aid station in the middle of the night, exhausted, dirty, chaffed, blistered, and stomach in full rebellion. That’s when a young child comes in handy at an ultra. Their worldview–stated or unstated–can get you on your feet. Nuance and pragmatism rarely help get you out of an aid station in the middle of the night. Absolutism and moral clarity do. Being an example does. But the decision to drop is usually complex and never a character litmus test. And that’s when kids’ judgments change from helpful to wrenching. They force an uncomfortable cognitive dissonance on us. You decide to drop from a race because you’ve been reduced to walking and you don’t want to walk for 30 miles. You’ve done it before and you don’t think you have anything left to learn from that kind of perseverance. It makes sense to drop. Then your awful kid demands you think in simple terms of right and wrong, should and ought. Gargh! This isn’t about digging deep and giving up. I just don’t have a reason to continue. And I don’t want this to be about digging deep and giving up. Nobody wants to deal with cognitive dissonance on top of a bellyful of gels and sports drinks. I don’t know what my kids will remember about my running 100-mile races. Memories of pilfering junk food from the aid-station tables will surely factor prominently. One-hundred miles is still an imaginary distance in Asa’s mind, and he’d definitely be more impressed with a fast 5k. I hope they won’t have too many memories of me struggling and dropping–mostly because I’m not excited about the prospect of that kind of suffering. Honestly, though, “Mom failed.” is fine with me, as long as they can couple it with, “But she’s going to try again.” How you deal with failure in a race can provide just as much of an example of grit, guts, and determination as not failing in the first place. How do your children factor into the decisions you make in running and racing? Can you share something funny or thoughtful or noteworthy that your kid said to you about your hard run or a race? Have you ever DNFed a race while your child observed? What happened? Felicia Wilkerson imparting words of wisdom after her drop. 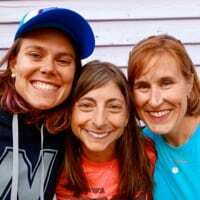 Trail Sisters is a group of three women, each with unique opinions, ideas, and attitudes toward all things trail and ultrarunning. Pam Smith is a mom, physician, and lover of running who lives in Oregon. Liza Howard is a mom and 100-mile specialist from Texas. Gina Lucrezi is a Colorado-based short-distance speedster exploring the realms of ultrarunning. I think my kids mostly think I’m nuts. I don’t have a lot of DNFs in my life, but I don’t have a lot of death marches either. They have their own passions, and frankly probably don’t think much about what I do. A toss-off comment, maybe, but I still cry when I think of it. I finished the Ice Age 50 in 10:27, feeling good and never hating it, crying most of the last mile. I think my son nodded when he heard. The conclusion suggests a really great parenting strategy. Mommy and Daddy DNFers set themselves up for even higher pinnacles of life-lesson-imparting PARENTING GLORY when they’re able to come back and finish strong next time. I am full of these kind of parenting strategies as you know. ‘Never fail’ isn’t a lesson I want my kids to learn either. Maybe in a year or two I’ll be looking for opportunities at ultras to teach them about failing constructively, not letting setbacks define who you are as a person, that kind of thing. They probably won’t get it. But they usually don’t get the important lessons on the first try. Liza, Thanks for writing this. It’s beautiful and so true. I think of my kids all the time while running ultras. And, I have to admit, on more than one occasion the thought of their reactions at aid stations has kept me moving forward. Cheers! Thanks a lot AJW. Means a lot coming from you. Liza, I always love your writing (and this column is no exception), and usually I can relate, but I can’t relate to this one much at all because my kids really don’t care much about my running. Whether I finish or not, whether I race or not, it doesn’t affect them one way or another — it’s just “mom’s thing.” This June’s WS100 when they crewed (age 15 and 18) was one of the first times they really got into it; they also tracked me online during a stage race, out of curiosity. But I don’t think how I do matters much to them or influences them much. The whole time they were little kids, my running was just something going on in the background that didn’t really affect them one way or another. So, while on the one hand what we do certainly influences our kids as role models, we shouldn’t expect it to have that much influence on them and shouldn’t be disappointed if they’re indifferent. We parents should let kids develop into their own beings and nurture their independence. I think kids’ reactions and what they internalize about ultras probably falls more on the indifferent and no-too much side of things. It’d be neat to hear from ultrarunning kids. Does commenting on irunfar comments count as nuturing independence if I haven’t seen or heard Ruby for more than five minutes? LOL! I realize re-reading my reply above that it may have sounded a little calloused; it’s partly my reaction to coming to terms w/ the fact my kids just didn’t care that much about running and looked hopelessly bored and tired when having to crew or wait at finish lines when they were little. I do know, however, that on some level they’re impressed and it gives me “cool mom” cred because their teachers or other adults, over the years, have mentioned to me things such as, “Kyle told me and his friends you’re doing a 100 and he sounded proud” :-). Asa and some kid he met tortured ants at Twin Lakes AS at Leadville — for hours while my family waited for me to come through. Only thing he wanted to talk about after the race. I’m sure Jason would much rather have been on the podium at UTMB than to have a great teaching moment with his 5-year-old son. But you have to deal with what the real world throws at you sometimes. I had the opportunity to spend 10 days with them around the race – we shared a house with several others – and came away impressed with his ability to deal with Felix’ (and his own) disappointment in a very balanced way. At the end of it all, Schlarb is a great dad. And that is much more important than finishing a race. The whole DNF psychology thing is overdone, if you ask me. > The first DNF I had appendicitis and didn’t know it. Emergency surgery after I got home. If I’d continued, and burst the thing somewhere out along the Wyoming Trail, it’s actually possible that my kids might not have a dad now. > The second DNF was at 76 miles after a night of serious hypothermia. Better planning would’ve helped, but more guts wouldn’t. I was having trouble doing 30-minute miles. Finishing wasn’t possible, but wrecking myself was. > The third DNF was when my knees both swelled up, and wouldn’t bend anymore. Pseudo-gout is the best explanation I’ve heard. I certainly could have done permanent damage to my knees, but finishing wasn’t a possibility. This year I had dramatic swelling of the feet & hands (it’s always something) … plenty of discomfort, but no post-race issues beyond skin and waiting for the swelling to go down. So I finished. It was beautiful. My ability to finish this year was in no small part due to 3 previous good-decision, constructive DNFs. My kids are more than smart enough to learn all the right lessons from that 4-year chain of events. If they were too young or overly simplistic to get it, it’s up to me as the parent to help them get it. What the child’s perspective does is help cut through all the internal BS in the heat of the moment. But if the child’s perspective is “dad quit” when dad had a condition that could have led to permanent damage or even been life-threatening, then it’s time for the adult to be the adult and help them understand. I do think a child’s morality is imbued with compassion. Sometimes it needs to be teased out — like you said by an adult being an adult. Also, congratulations on your finish! and the good decision-making. Great words of hard earned wisdom! Karl failed 2 times then hit the FTK on the Appalachian trail out of the park. Fail and plant the seed for greater future success. Kids are great for training…mental callusing! To put a different spin on it, I was doing Rim 2 Rim 2 Rim of the Grand Canyon this year and my body started breaking down badly early on. I kept going and after 30+ miles, most of which without being able to keep any food or water down, I was completely drained and still had to climb out a very steep 10 miles in the dark and cold. Thankfully, my wife was waiting at the bottom of the South Rim to climb with me. With a couple miles to go, I had collapsed on the trail. I was shivering uncontrollably and could not imagine being able to hike to safety. It was my wife reminding me of our three children waiting at home that got me back on my feet and climbing those last few miles. Mark, I got sick and started peeing dark urine when I ran Javelina. It was close to the end of the race, and I finished. I ended up in the hospital with rhabdo. It was awful because I knew that with two young kids, I’m not allowed to be dumb or irresponsible when I’m racing. I will never tread so close to the line in a race again. Thanks for these last two sentences. I have a young son and that’s exactly how I feel. I chafe at the self-imposed limitations sometimes and at the inordinate amount of self-preservation/fear I am hit with at times on “trails” in the mtns that I didn’t used to feel much concern with, but I sure don’t want to miss these precious years w my kiddo due to being “dumb and irresponsible” in my races or adventures. I find that comment (and honestly the entire article) kind of odd. Because those of without kids are allowed to do something dumb that will end up killing us or causing long-term damage? Because we have nothing to live for? I DNF’d for the first time this year in part because I wanted to be able to play with my kids after. I could have finished and wrecked my body and spent hours lonely on the trail but why when I have a family waiting for me? They didn’t care (they were at home not at the race). I previously finished the race so what’s the big deal? Sure I wanted to finish but the punishment and possible injury want worth it. Jonathan, I crewed a friend and client this year at Leadville, and stomach troubles had reduced him to walking. He decided he didn’t walk for 25 miles. I did my best to convince him to walk for a while and see if his stomach would settle down. He wasn’t interested. I gently suggested that his son was planning to run the last 3 miles with him — and wouldn’t that time be unforgettable/quality time. He told me he knew exactly how he could spend quality time with his son — by stopping and spending the night and morning with him. Touché! I remember my son’s reaction 2 years ago at the finish line of the mountain masochist 50-miler. He asked if I won, and I said ,”No, I came in 2nd female”. With complete disdain on his face his response was,”so you came in last?”. “Well, son, I came in 2nd, so only one woman beat me.” My son-“so you lost”. Well, geez, be harsh about it! They have no sympathy for what I do. When I finished Western States and showed them my belt buckle, they just wanted to know where the trophy was. Kids are the best at keeping not you humble! It’s such a weird conversation to have, right? On the one hand you want to give perspective and set the facts straight, but on the other hand you don’t want to sound full of yourself. I’ve heard that “No trophy?! ?” complaint too. Sheesh. Hi Heather! I want somebody to say “hogwash! !” to me in a race. Your boy is one lucky little guy to have you as a mom. Great article. Thanks for sharing. I ran a 50K last month in which my family (wife and two boys, ages 4 and 7) came for the race weekend. We camped out by the lake and slept in a big tent together, which was so exciting for them. Then, during the race, they all volunteered (not sure how helpful they were) at an aid station just a few K from the start/finish. When I passed by them near the end, I was a little disappointed that they wouldn’t see me finish, but I was also so proud and happy that they were involved in the overall race experience. Of course, I had to take a short break to give them both hugs and kisses and a high five. Then, just a few minutes before the finish, they drove by me in a car owned by another volunteer. This meant that I could cross the finish line with them hand-in-hand. After many ultra finishes over the years, I think this was the most special. Both 100’s I’ve done I had a kid crewing. The last one I came down with cellulitis in my calf and probably should have dropped but I just couldn’t. Knowing my daughter had spent her whole weekend loosing sleep and waiting on me hand and foot at aid stations was a huge factor in refusing to quit. I just couldn’t not finish that race – it would have felt like I was not only failing myself but her and the rest of my crew. Calf cellulitis! That’s awful. Did it heal quickly? Were you glad you continued? Yeah it did, actually – I didn’t know it at the time and I still have no idea how I contracted it. I am glad I continued. I’ve never had so much pain when running – I thought for sure I had torn my meniscus or ruptured a muscle or something really horrible. A week of antibiotics and it was gone. I finished next to last but I got another ticket for the WS pot and all the people that helped me finished along the way have my heart forever! Honestly, it was the most amazing thing being on the receiving end of all that care and assistance. Having my kids at ultra has at times actually had a different effect on me in a 100 mile race. Once , I told them I would complete the race early the next morning and they could come cheer me into the finish. I got really sick (altitude, poor nutrition) and therefor really slow so that by my calculations if I tried to continue or took a nap I would be many hours past my planned finish. I opted to drop (because I could barely move) but also in part knowing they would be worried about me. I’ve learned not to tell them my goal finish time. My middle child is 6 and loves to run. It is hard to take her to see my husband or I at ultras because she does not understand why she can’t run the rest of the race with us. I have a great picture of her in Foresthill looking dejectedly at the ground while her Dad is running away in the background, lol. One thing we do is try and have the kids do a race or two of their own each year. I like to find kid’s races for them where they get a number and a shirt. The above mentioned daughter won her last race this year and was so proud. She even got a very cool trophy for her win. We also try not to take them to too many races because they get bored and I’m worried it will make them dislike running. My sons are now at the age where they are starting to understand my racing. At least they sort of know what it is that I’m doing. I know it has an impact because they want me to race them while they ride their bikes. As much as I want my kids to see me finish strong and win, they need to see their dad fail even more. They need to be taught how to handle it when a race (or more importantly, life) doesn’t go their way. They need to see me live out in front of them that our self-worth does not come from racing victories or “strong days on the course”. They need to see me win graciously and lose graciously. The last thing I want my kids to think when they are racing one day is that they “have to win/finish” because dad always did. I want them to always give 100% but when that isn’t enough I want them to know that they are still loved and nothing they ever do or don’t do, will ever change that. Two years ago at the Fall Superior Trail Races, I was working at the mile 72 aid station. We were a few minutes away from the cutoff time, and we were getting the last 100- and 50-mile racers through as the course sweeps waited to start. Five minutes under the cutoff, a 50 mile racer came in, looking harried. Her husband and kids ran to meet her and her little boy exclained, “Mommy, you made the cutoff you were worried about! Now I KNOW you’ll win!” She stopped looking worried, broke into a smile, and headed out, ahead of the sweeps. Started 2009 UTMB with a not-quite-recovered stress fracture in my left foot. Dropped at Champex in 40th place, but foot was so swollen and painful, I couldn’t put any weight on it or lace up the shoe. My wife and small kids were there and very sad. About 2 month later on a business trip to Asia, I got to my hotel room, turned on the TV to a Japanese station. I was causally glancing at the TV when I noticed my entire DNF at the aid station was on a documentary about trail running. They even got closeups of my kids’ worried looks. Unbelievable. I got to live the whole thing all over again. I don’t speak Japanese, but the narrator sounded dramatically somber.